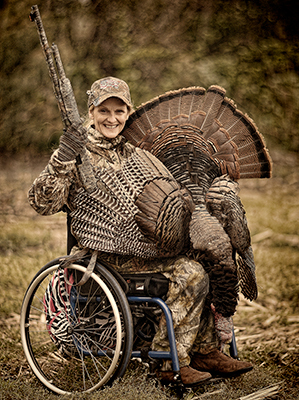 My firearm experience began as a young girl growing up in a family of hunters. It was simply part of life. My dad grew up catching or killing supper, and it was a heritage he was proud to pass along to my brother and me. As the youngest, though, and being a girl, I grew up for the most part carrying the varmint bag, enjoying rabbit and squirrel hunting the most. When we visited the family farm, hunting was a special privilege we didn’t often have the opportunity to do at home. My grandfather was also a huge raccoon hunter, but that was a late-night activity considered not fitting for a little girl. Deer hunting was another thing I didn’t get involved in much. Somewhere around the time I was old enough to handle guns, I also got boy crazy and tagged along less frequently. Fast forward a few years. I got married to one of those boys and bought him various guns for Christmas gifts. One of my first loans was to buy a gun cabinet for the gun collection we had started. While none of the guns were mine, I never had a fear of them because they were a normal part of life. Fast forward again, and I’m unfortunately going through a divorce. Life choices have consequences, and I made some that were less than wise. I moved to a larger city and was living alone. My ex-husband remained concerned for my well-being and wanted me to carry a gun for protection. He gave me his Ruger Single Six revolver, which I carried openly. At the time I was working at a place that sold fire, police and EMT uniforms. A friend agreed to go to the shooting range with me so I could remain comfortable with my carry gun. I left my apartment on a regular basis carrying it by the handle, down by my side, as I didn’t have a holster for it yet. I was never nervous about it because I respected it and felt comfortable pulling the trigger if needed. On Jan. 9, 1995, I left for work planning to go to the shooting range that afternoon. I wondered if someone who saw me going into work carrying it would be uncomfortable so I put it under a newspaper and tucked it under my arm as I went out to my car. When I sat down in the car, just enough pressure was released on my gun that it fell, hit the pavement and discharged. The bullet went through my left kidney and spine, immediately and permanently paralyzing me from the waist down. "Today’s young people need to hear the positive side of firearms use for shooting sports, personal protection and legal, regulated hunting from someone whose life was forever changed by a defective gun." I remember hearing myself scream, “No!” as my ears rang from the gunshot. No one was around in the parking lot and no one came from the apartment complex to help. Just a few months prior, I was blessed to have gotten my first cell phone for my birthday. I called 911 and told the operator that I’d accidentally shot myself. We went through the usual questions, but instead of staying on the line until the paramedics arrived as instructed, I said I needed to go and call my parents. When Mom answered the phone, I told her I’d shot myself. I didn’t know what to tell her as to where the ambulance would be taking me. We got off the phone and I called into work. I talked to the friend I’d planned to go shooting with and asked him to tell our boss that I wouldn’t be in today. I had no clue just how long the journey back would be. A short time later, it was incredible to realize that while my parents didn’t know my friend, God had connected their phones. That’s how my parents learned where the ambulance was taking me. While still in the hospital, I had a couple of doctors ask if I would mind if they “put my name in” for a program they thought might be of interest. At the time, I was adjusting to heavy medications and dealing with the depressing fact of a life forever changed. I never thought this would happen to me. That program turned out to be a national program called “Think First.” It’s a trauma-prevention program presented mainly to middle and high school students to help them learn to stop and consider making smarter choices to help prevent traumatic injuries, especially to the brain and spinal cord. I was asked to be one of the program’s VIP speakers. A year and three months after my accident, I was in a high-school gymnasium a couple hours from my parents’ home, where I’d lived since my initial hospital and rehab stay. The gym was full with about 600 students, and I was about to give my first public speech. I was still sick often from pancreatitis and now from nerves on top of it. I remember speaking to a gentleman who also was there for a presentation. His words of wisdom were to “know what you’re starting and ending with and fill in between.” I had no clue of either but, in the center of the gym floor, I began, choking back tears from having to relive the events of that dreadful day. From that point, I’ve known my purpose in life—and the purpose of the accident—which was to share my story. I’ve been blessed with many opportunities through the years and consider it a privilege anytime I have the chance to reach out to others and possibly change a life by helping someone else think about his or her choices and the power that lies within them. Sometimes it’s just a matter of helping others to realize everything they have to be thankful for—and the many things we often take for granted. About 10 years ago, a dear friend and fellow church member repeatedly asked me to go hunting with him. He was involved with a group that focused on getting individuals with disabilities back into the woods or to go hunting for the first time. I took him up on his offer and can’t thank him enough for his persistence. I have since remarried and to this day, my husband and I make every effort to stock our freezer in this way. I love the feeling of accomplishment that comes from hunting and also enjoy simply being back out in the woods the way I was as a kid. But now I enjoy even more God’s magnificent creation and grace for second chances in life and love and in helping me to make a difference for others. Talk about a long journey. It has been over 23 blessed years, and I’m thankful God has given me the grace to deal with what many would see as a less than perfect situation. Now more than ever, today’s youth need to hear that we’re responsible for our choices, which have rewards or consequences. Today’s young people need to hear the truth: We have a head and heart problem—not a gun problem. They need to hear the positive side of firearms use for shooting sports, personal protection and legal, regulated hunting from someone whose life was forever changed by a defective gun. Even though the fact it was defective, I never sued anyone or any company. I took full responsibility for my actions and today I continue to sit before young people to encourage them always to consider their choices. Over the past few years, the hospital hasn’t used me in the program quite as often. Because of the changes in the hospital’s program and the liberal views its staff has toward guns, I decided to make a difference by building my own program called “Taking Aim: Changing Lives.” It involves the same principle idea I’ve always presented, but now no one can limit me or my pro-gun perspective or the places I’m willing to travel to speak. I have an inspiring and encouraging story to share. We all need those from time to time. I want to be able to reach out to others and offer my program—wherever needed and at no charge. Today’s schools are already facing many budget cuts without expecting them to pay for a program that previously was offered at no cost. With that in mind, I hope readers of this story will consider supporting me and my program. Awareness is priceless, but getting the word out comes at a cost. If you would like to have me come speak to and inspire your team, church, school or civic program, or help me to advance my cause, please contact me—LaDonna Pearson—at 859-428-8656; byweelzigo@aol.com or message my Facebook page, Taking Aim: Changing Lives.